Carolyn Bullock attended North Carolina Central University majoring in Visual Communications. Shortly thereafter she moved to Philadelphia where she became the wife of Pastor Johnnie P. Bullock. At the age of 12, Carolyn accepted Christ, but grew into the knowledge of whose she was at the age of 27. Her love for Jesus and a constant hunger for Him inspired her with greater intensity to be more like Him and a need to share with others the love, peace, joy and wholeness that only Christ can give. She believes the Word of God has to be understood to move us into obedience, and obedience will move us into the wealthy place in God. 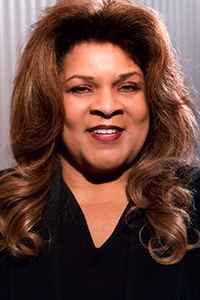 Her biblical training includes that of the Truth Bible Institute of St. Matthews Baptist Church, Bethany Baptist Church Minister’s in Training and the Destiny Center of Bethany Baptist Church. As First Lady of both, the First Baptist Church of Florence Estates, in Berlin, NJ and Star of Hope Baptist Church in Philadelphia, PA. Carolyn has managed to be, as Paul would say "I am free from all men, I have made myself a servant to all, that I might win the more". Carolyn teaches Bible Study and discipleship classes and is a noted church conference speaker. Carolyn has over 15 years of Human Resources experience with a concentration in employee benefits and employment training. Her personality embraces conscientiousness, balanced with fundamental beliefs such as loyalty, duty, honor and integrity. She has a friendly, yet assertive disposition that allows her to perform well in her role of leadership and management. Her life is that of expectation, believing that God knows the plans He has for her and they are plans of good and not of evil to give her an expected end.